The UK’s thrill-capital, THORPE PARK, leading next generation film studio LIONSGATE (NYSE: LGF) and TWISTED PICTURES partnered together to create SAW – The Ride, the world’s first ever horror movie-themed roller coaster/darkride hybrid, which opened to rave reviews on Friday, the 13th of March, 2009. 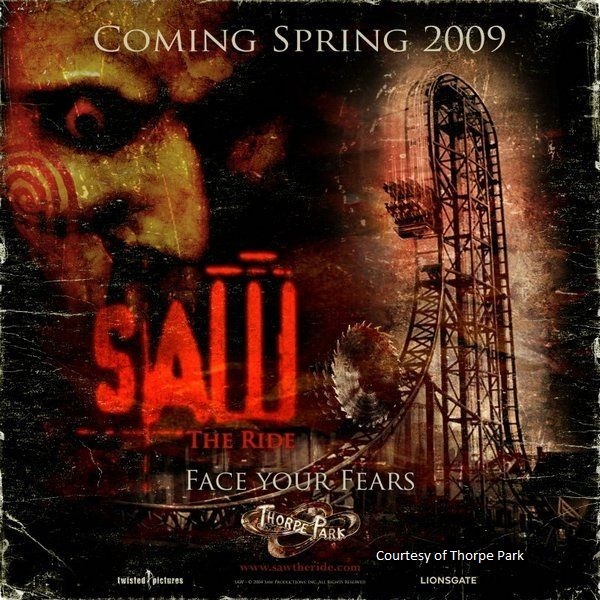 Based on Lionsgate and Twisted Pictures’ Saw film franchise, the most profitable horror franchise in movie history, SAW – The Ride is literally the “scariest ride in the world”. 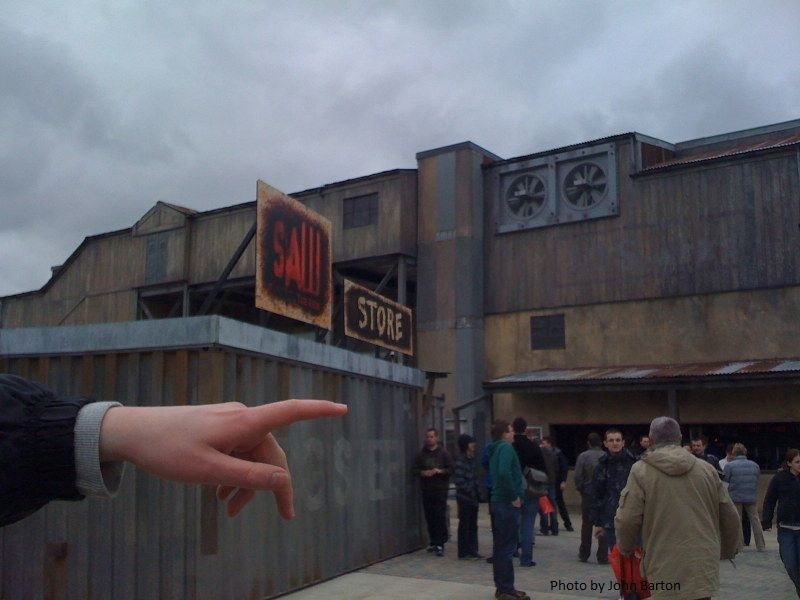 The latest installment in the film series, Saw V, premiered on October 24th, 2008, and Thorpe Park took advantage of the film’s opening to launch their own ad campaign foreshadowing the terrifying new attraction and inviting visitors to ‘Face Their Fears’. Like the underlying plot of the Saw the films, Thorpe Park’s new attraction tests the nerve of all who dare to ride it and visitors find themselves at the mercy of the series’ master manipulator, Jigsaw, to endure a series of nerve-shredding challenges guaranteed to set pulses racing. The ultimate test of SAW – The Ride is an insane ‘beyond vertical’ drop of 100º from a height of 100 feet, making it the steepest freefall drop of its kind in the world. Riders then endure three inversions that add another dimension to a whole new experience of adrenaline-fuelled fun for thrill seekers. SAW – The Ride continues the growth of the Saw franchise as an international cultural touchstone. The original 2004 Saw launched a new wave in horror films and introduced a bona fide icon of terror: Jigsaw, the philosophically-inclined psychopath with an exacting moral agenda and a genius for gruesome games of survival, ‘played’ with those he believes have ceased to value and appreciate the gift of life. Ratcheting up tension and invention with each successive film, the Saw franchise has become a part of the zeitgeist while jangling nerves around the world. Candy Holland, Creative Director for Merlin Entertainments Resort Theme Parks, is the woman behind the ride and arguably has Britain’s scariest and most exciting job. She is an extreme thrill enthusiast and has drawn on her extensive background in theme park and theater set design, working with the project team to make it the “scariest ride in the world”. Candy was also responsible for the creative development of Thorpe Park’s Stealth coaster and Se7en maze, and the Oblivion and Air coasters at Alton Towers Resort. While planning the ride, Holland commented, “I’m a huge fan of horror films and am utterly relishing creating the scariest ride in the world. Anybody who has sat through a Saw film scared and terrified beyond belief will have some idea of what’s in store for them at Thorpe Park. SAW – The Ride is going to be shocking and intense…both physically and psychologically…and is sure to give you nightmares. The new ride is the park’s fourth major roller coaster, joining an already impressive portfolio of extreme ride experiences, including Stealth – Europe’s fastest roller coaster, Colossus – the world’s first ten looping roller coaster and Nemesis Inferno – the 4.5 G-force experience. Much like Mystery Mine at Dollywood in Pigeon Forge, TN, USA, SAW – The Ride is a custom Gerstlauer Euro-Fighter roller coaster with both indoor darkride-like elements as well as exciting outdoor airtime hills, mind-bending inversions, and of course the necessary trademark Euro-Fighter beyond-vertical drop, this time with an added spinning saw blade – the ultimate “head chopper”. Situated in the park’s Canada Creek section, SAW – The Ride’s queue, station, and darkride portion are housed in an old abandoned industrial sawmill building on a man-made island. Riders meander through an outdoor queue of razor wire-topped chain link fence switchbacks with parts of Jigsaw’s traps all around. A police patrol car with a bloody cracked windshield is parked out front. The officer is trapped inside the mill. Will he make it out alive? Riders will find out inside. Inside the building, guests come face-to-face with live actors portraying Jigsaw’s victims restrained in various traps. One of Jigsaw’s hooded “apprentices” even makes an appearance. I’m not sure a park has ever incorporated live actors into a queue line like this before…certainly not in the US. But this daring move on the part of Thorpe Park is part of the reason why the ride is not recommended for guests under 12 years of age. The scenes of torture and terror in the queue are certainly not for the faint-hearted. The queue is made to look like Jigsaw’s workshop with mannequins and traps strewn around. Countdown clocks and video cameras like those seen in the Saw films foreshadow the ominous test that riders must endure aboard the ride. The queue even has real traps designed to catch the guests off-guard. One such trap is a pair of shotguns aimed down at the guests from above. When guests walk beneath the guns, they “fire” and blasts of air shoot down. “Billy,” Jigsaw’s twisted clown-faced puppet tells guests of the test he’s set up for them from the TV monitors overhead, inviting them to “play a game”. On the way up to the loading station, guests ascend a flight of stairs, passing a body trapped in a web of razor wire, mimicking a scene from the first Saw film. Once on board the themed 8-seat Euro-Fighter cars, riders find themselves in the middle of one of Jigsaw’s sadistic games. Trains are dispatched in pairs and the two trains turn right and enter the dark bowels of the abandoned mill. Once around the bend the two trains meet Billy the puppet on his tricycle, who explains “the game”. The first train lurches around the corner to the right while the second train pauses. Riders find themselves heading straight for two dimly black-lit swinging pendulum blades criss-crossing right in front of them. The train suddenly plummets down a vertical dip into the darkness, the riders barely escaping decapitation from the pendulums by inches. After twisting through the darkness, riders glide through a brake run themed as another trap. Crossbows on the walls shoot arrows at the passing riders (really just blasts of air). Then the train U-turns and negotiates what is probably the most disturbing scene in a ride ever. The train performs a barrel roll right over the bloody body of the missing police officer. And disgustingly, the body squirts blood (really just water) up into the faces of the riders flipping above. The train then travels outside the building for the ride’s twisted outdoor finale. Riders turn and slowly approach the ride’s 100-foot tall vertical lift. The trains come to a stop and Billy appears on TV monitors on either side of the lift. He tells riders that the game is over and he laughs as the train quickly ascends the lift. Rapidly cresting the top, riders are “ejected” down a crazy head-over-heels, airtime-filled, 100° past-vertical, 50-mph drop. The drop’s pullout sends screaming riders just inches below the giant spinning saw blade “head chopper” and up into the force-filled Immelmann loop. Next come an air-time pop hill and the midcourse brakes – which trains fly right through – before twisting through the ride’s third inversion, a dive loop. Riders then return to the unload area inside the mill building. The exit queue takes guests past the on-ride photo booth and souvenir shop. The ride seems to be a huge hit with park guests. For a firsthand point of view, I interviewed John Barton, one of the Web masters of the Alton Towers fan site Towersnerd.com, the sister site of the Thorpe Park fan site Thorpenerd.com. Derek Rochelle: You are one of the Web masters of Towersnerd.com, an Alton Towers fan site, right? John Barton: Yes, I have been a part of the Towers Nerd team as a gaming and simulations developer for just over a year now, creating and designing many ride simulators and games based around the Alton Towers Resort. DR: I understand you were invited to the special Friday, the 13th VIP premiere event for SAW - The Ride with your friends from Thorpenerd.com. How many people showed up for the event? JB: Friday the 13th was a very fitting date for press day which seemed to put some enthusiasts on tender hooks just in case. That day was originally just for the press to ride and review however all Merlin annual pass holders were invited along for the day with a £5 charge to ride on the new coaster between 2 and 5 o'clock. Everyone was given a select time to ride and we all got the red carpet treatment as we entered through the gates of the park. Around 500 - 1000 people turned up for the day making queues for any of the other rides open minimal. Later on in the day they opened up the ride queue line to SAW for unlimited rides where the queue line was around a 5 minute wait. DR: What was the general reaction of riders? JB: Many of the guests which came off the ride were wanting to go on again and again. Most of them were running from the exit to check out their photographs and see the horror in their faces of what they had just done. Everyone came off saying how well themed the attraction’s interior was. DR: I know the majority of riders will be impressed most with the ride's outdoor drop and inversions, but being with the Darkride And Funhouse Enthusiasts, I must ask what was your impression of the indoor darkride portion of the ride? JB: The queue line is the first area which is a dark walkthrough section of the warehouse. The queue line is a great scene setter, including live actors in amongst the queue line. These are mostly in some of Jigsaw’s traps. The station area is very well detailed with technical drawings of torture devices spread across the walls which makes it very taunting for the rider. Once aboard the ride you head straight into the darkness not knowing what will be around the next turn. Depending on the train you are riding in will change the show slightly. The first element of the ride is a near vertical sharp drop in the dark which has an amazing head chopper effect of spikes and axes. It is very unexpected for how small the show building actually is! Many of the darkride special effects are black light lit and this can cause you to interpret the effects in different ways. DR: Do you think more parks should pick up on this new trend in themed coaster/darkride hybrids like SAW at Thorpe Park in the UK and Mystery Mine at Dollywood in the US? JB: The element of using a hybrid ride with a darkride themed section should definitely be something that more theme parks should look into. It adds a new thrill to any attraction and brings riders back wanting more every time. Including not only an outdoor section which offers the riders a big thrill but the indoor sections creates a lot of tension for the riders who are oblivious to what is about to happen. DR: How do you feel about Thorpe Park suggesting that ride is not suitable for riders under 12 years of age? JB: There has been some debate about whether or not it was morally correct for a theme park to create a ride based around the Saw films and promoting them. However, from my experience of dark houses and walkthrough attractions in the UK the ride does not touch up on anything which would be seen as disturbing or horrific. There are no animations of people being tortured and only 2 bodies situated in the ride; one in the queue line amongst barbed wire and another under the barrel roll inside which shoots water. There does not seem to be anything that any 12 year old wouldn't have seen before. It’s the choice of the rider after all and there are plenty of warnings about what happens inside. It’s more of the tension and fear the rider builds up before riding which makes it scary. It is by far not as scary as any of the walkthrough attractions they have at Halloween. DR: So what is your overall opinion of SAW – The Ride? JB: SAW – The Ride in my opinion is a very well designed roller coaster/darkride which includes some brilliant special effects and theming. If you have seen the films you will notice a few of the scenes implemented into the ride design. Also there is a slight story line behind the ride including a police man whose blood-splattered car is outside and a radio call can be heard from inside it trying to contact him. Then no one is quite sure due to how quick the effect is but the final body you see is possibly the body of the policeman you find. However it is up to the rider to see how they interpret the attraction. For more information on SAW – The Ride visit www.thorpepark.com.